My friend Jerry reminds me of the book character Amos McGee. Like Amos, he is friendly, patient, and generous with his time. Even though he has a lot to do, he always makes time to visit. 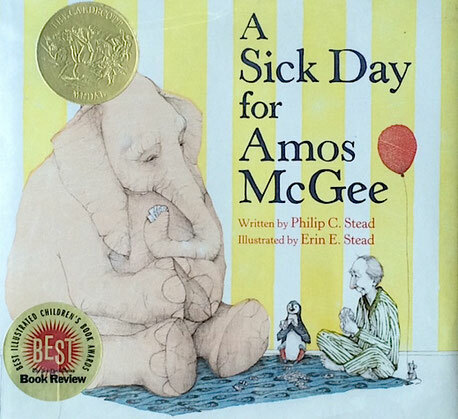 Erin Stead won the 2011 Caldecott Medal for A Sick Day for Amos McGee, which was written by her husband Philip Stead. The book, about a zookeeper who always has time for his animal friends, is lovely and charming – much like the illustrator. She won the medal at quite a young age – late twenties. In fact it was the first book she ever illustrated – amazing! She had stopped drawing for three years due to “a severe and self-inflicted loss of confidence.” At the end of the third year, she realized that by not drawing, a part of her was missing. If you have any tendencies toward introversion or shyness, read her acceptance speech. It reminded me of the book, Quiet: The Power of Introverts in a World That Can't Stop Talking. 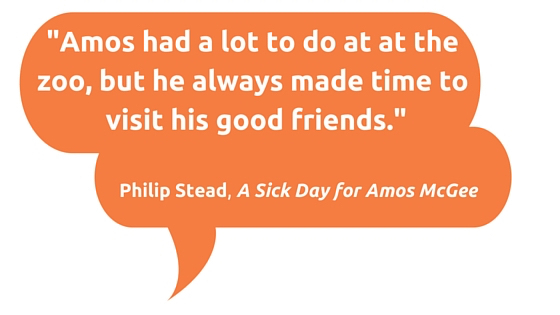 Amos is a quiet man, but he makes a big impact on others. We all need friends like Amos (and my friend Jerry). This heartwarming book reminds us to take time for our friendships because they are well worth it.